NextGen Player - Canada's Premier Entertainment Blog: New Xbox Dashboard Update Coming Soon? 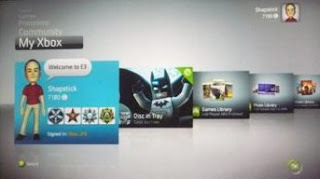 When Microsoft revealed details about their newly designed Xbox 360 dashboard at E3 a few months back, many folks started getting fairly excited about all of the new features that would be included such as the ability to create avatars, Netflix partnership (US only...boo hoo...maybe an opportunity to team up with Zip.ca in Canada???) and the revised menu system. RPG-TV was able to get some interesting news from the Microsoft UK team that hinted at a November release. NextGen Player will keep our ears open and update you as more news comes out on this. Make sure to visit NextGen Player regularly to received the latest news on this story.